It’s funny how much can change in one year; I’ve said to many people already if you had told me this time last year that in a year’s time I’d be a published author at the age of twenty six I quite simply would have laughed at you. In January I opened an email that had landed in my inbox from DK asking if I’d be willing to talk about collaborating in a cocktail book with them. Initially I was hesitant, because like a good Sunday roast at that time of the year my plate was largely full with the creation and launch of the American Bar’s latest menu “Every Moment Tells a Story”, and impending guest shifts in Greece, Singapore and the USA coming up, there wasn’t much room for extra activities. However, urged by family and friends I explored a little further and decided this was too good of an opportunity to pass up. Sure I’m no writer but I’m good at what I do and it’ll be a fun challenge to translate that into another (hardback) dimension. Much of March, April and May I spent going between my kitchen writing the book, the American Bar at work or sleeping if and when possible! Although fun, what was initially going to be around 30 recipes naturally progressed very quickly to over 50… and so did the reading, research, and paperwork. Whilst simultaneously pulling together and launching our beautiful new menu, I’m still not entirely sure how it all came together on time! Then came the photos… and this was the fun bit! Thanks to William Reavell photography we spent four fun days in a studio in Kennington making and shooting drinks. Eternally walking around with a bottle of Prosecco in hand keeping everything fizzy and pretty felt like the life I was designed for! We then had a few more days attached to shoot the other bits and bobs… glassware, equipment, stirring and shaking methods, and even a few shots of me. Through June and July there were hundreds of emails back and forth tweaking and adjusting and re-proofreading; and then through the rest of the summer, whilst the book has been being printed, I had a bit of a break in preparation for the launch, which was on 1 of November. The amount of love and support I have received has made the whole thing such an incredible experience, and having been so far outside my comfort zone I have been truly overwhelmed by the response the book and I have received. Thank you. 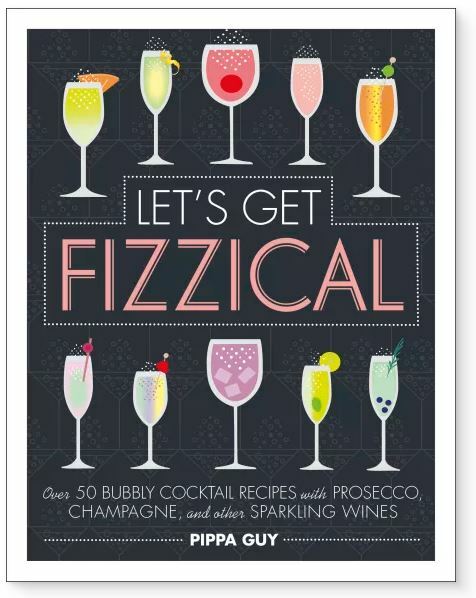 CREDIT: Let’s Get Fizzical by Pippa Guy. DK. Let’s Get Fizzical is available to buy from Savoy Tea shop, the Savoy gift shop in the hotel.